It would be hard to understand either disaster without a reference to the brutal ravages of two out-of-control markets which habitually devastate lives. In September 2014, the Mexican town of Ayotzinapa became world-famous overnight, when a group of 43 poor, radical and indigenous students from the local teaching college went missing after being attacked by police in Iguala, a town also located in the narco-dominated state of Guerrero. Facts about the students’ fate were scarce, but it was soon abundantly clear that the Government’s story that they had been kidnapped by drug gangs didn’t hang together and that ministers and military figures were protecting whoever was responsible. Demonstrations demanding truth and justice swept the country, and the number 43 quickly came to symbolise all that was corrupt about how the country was run. Last week in London, just a few days after the general election narrowly returned a Conservative majority, a fire suddenly burnt down an apartment block housing hundreds of mostly poor residents in a very wealthy part of London. The sight of residents signalling helplessly and desperately throwing their children to safety from windows created popular revulsion, and as the facts emerged and speculation spread as to the fire’s cause, there was a sense of widespread outrage at the outsourcing, costcutting and official indifference to the living standards of the poor, which all seemed to have played major roles in the disaster. 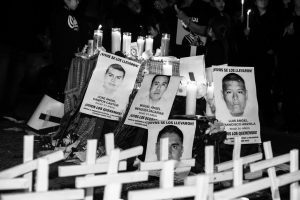 I recently spent a year in Mexico and had attended events in both London and Mexico City in relation to the disappearances, and something about the reaction to the Grenfell disaster struck me as similar to the response in Mexico to the events in Iguala. To explore this further, I spoke to a few better-informed friends who have a foot in each country. All were keen to stress the basic factual distinctions between the two situations. One major difference highlighted by Rod, an economist who has lived in Mexico City for over 30 years, is that in the case of Grenfell there has been no fairy story, no apparent cover-up by the authorities. Although it’s certainly the case that the Daily Mail and Express both tried to scapegoat first an Ethiopian immigrant and then EU environmental regulations for the fire, those explanations were not at the heart of the State’s explanation. Rod points out that while Theresa May took some responsibility for the deaths and, after some prevarication, did visit the site, Enrique Peña-Nieto, the current president of Mexico, avoided doing so altogether. Peña-Nieto represents the Institutional Revolutionary Party (PRI), which held power uninterruptedly from 1929 to 2000 and returned to governement in 2012. Kevin has lived for more than ten years in Mexico but visits the UK regularly and follows events closely. He argues that while the disappearance of the students marked a political turning point in Mexico, with the President’s approval ratings never subsequently recovering, May’s premiership had already suffered a major fall in popularity. He also makes the point that while the Grenfell Tower is situated only a bus ride away from Westminster, the centre of political power; the same is not true of the events in Mexico. He also adds that while most British people would probably have at least some faith in an official State-led inquiry, most Mexicans would not. Pablo is a photographer and activist who now lives back in Mexico but was previously part of the London campaign for justice for Ayotzinapa. He points out that the response of the national media has been very different, with sections of the pro-Conservative press in the UK making a serious attempt to hold May’s Government accountable, whereas in Mexico the pro-PRI media made every effort to try to sell the Government’s ‘historical truth’. Pablo also points out that the international media response has not reached the same level. However, as Lisa (a human rights activist based in London who has lived in Mexico) argues, the international attention has not helped the families of the disappeared obtain justice, even if there is now more global awareness of the human rights situation in Mexico as a result. All, nevertheless, do see some points of similarity. Rod argues that in an increasingly fragile world which, as Naomi Klein points out, to some extent depends on disruption, both events were, in different ways, disasters waiting to happen. He also makes the point that both caught the public’s imagination, and that in both situations public outrage would presumably be even greater if the full details were to be known. Both events were, in different ways, disasters waiting to happen. For Pablo, both events were characterised by a lack of official interest in protecting the most vulnerable, and the public outrage in both cases partly resulted from decades of inequality. Lisa echoes this, highlighting the fact that both disasters happened to people who have no power and who routinely suffer discrimination. She draws a further analogy with the 1989 human crush at Hillsborough football stadium in Sheffield, in the wake of which the families of the victims were routinely smeared and depicted in the tabloid press as subhuman, in part on the basis of a police disinformation campaign. Rupert is a researcher whose expertise draws on decades of experience of the human rights situation in Mexico. A common theme which he identifies involves incompetent authorities blaming each other, leading to general outrage and contributing to the sense of a government which does not serve the people. He points to the fact that in both the UK and in Mexico relatives of those missing were left to conduct their own searches. Also, in both situations, the sense that the state is incapable generated waves of public sympathy and solidarity. Robin, a human rights campaigner who spent several years in London and now works in Mexico City, argues that both cases exposed shameful structural problems: the the destruction of the welfare state, marginalization of specific communities, housing inequality and lack of investment from the state in the UK; and the consequences of the ‘war on drugs’, corruption, impunity, widespread human rights violations in Mexico. The events clearly demonstrated that changes are urgently needed. Although Robin points out that the prospect of major change in Mexico is not in sight, Rod makes the point that Presidential Elections in 2018 could unseat the PRI and bring a left-leaning government to power, allowing some light to be shed on what exactly happened to the students. The deep-seated electoral machinations of the governing party do not make this an inevitable scenario, however. Of course, as Rupert stresses, it’s important not to stretch the analogies between the two situations. Nevertheless, it would be hard to understand either disaster without a reference to the brutal ravages of two out-of-control markets which habitually devastate lives: the market controlled by global narcotics industry, now widely believed to have played a central role in the disappearance of the Mexican students, and the housing market in London. I hope it’s not too fanciful to see in Grenfell Tower fire another ominous reminder of our rapidly overheating planet, one recent symptom of which was the sight of people burned alive in their cars in Portugal. In all of these cases, those who call for a more rigorous protection of environment and society are habitually ridiculed, vilified, scapegoated and abandoned to their own fate by politicians at the often personally lucrative service of an ideology, which regards the public good, including any number of individual lives, as worth sacrificing in the pursuit of private profit.